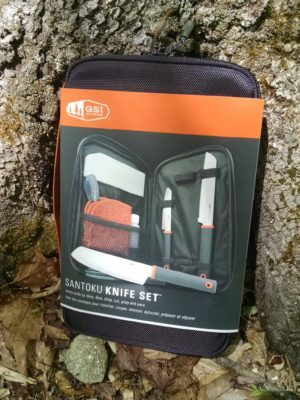 The GSI Outdoors Santoku Knife Set was provided to this reviewer for a full review. 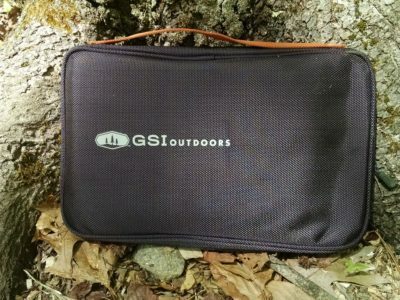 GSI Outdoors has recently come out with this handy set of kitchen knives for home or camp. See their web page HERE. The two pictures below I took when I received the knife set. The zippered folio it comes in it well designed. I will say that the small bungee loops that hold the knife handles are a little frayed which is a quality control issue I think. But between the loops and the hook and loop straps, the knives are held securely in their respective places. 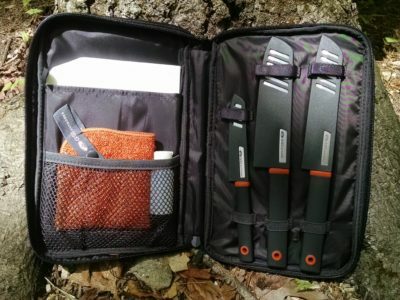 The knives included in this kit are very well made for the price of all included. The handles are slim but comfortable for basic camp cooking chores. 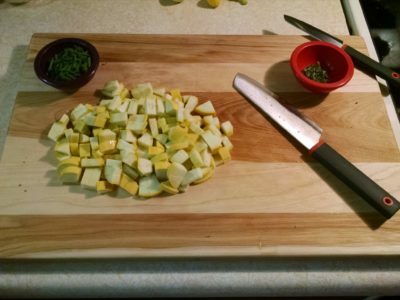 I would not want to have to slice up 50# of potatoes or anything with them, but they are a nice size and are balanced well for basic chores. They came very sharp but protected with their sheaths. I hit them with my Spyderco SharpMaker sharpening system and a leather strop after I tried them out and I got them razor sharp just to see how they would take an edge. The blades are pretty thin so they took an edge pretty easy.